Tri-Star Glove makes heat resistant gloves for many tasks. ​from the threat of thermal transfer and burns. 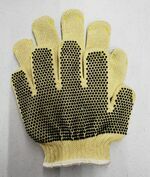 ​PRODUCT DESCRIPTION: The TSG-3150 is a 7 gauge heavy weight, Glove-in-a-Glove. The outer glove is 100% virgin Twaron® and the inner glove is constructed with 100% cotton, combined at the cuff edge to create a single glove system. The TSG-3150 includes a 2” cuff with an overcast edge. Fit and sizing of the TSG-3150 are incremental, providing consistency of product and performance.This glove is also able to be laundered, providing cost saving opportunities. ​The TSG-3150 glove-in-a-glove targets work areas requiring heat, cut, and abrasion protection such as parts handling, stamping, and some plastics departments. PRODUCT DESCRIPTION: The TSG-144 is a 7 gauge heavy weight Glove-in-a-Glove. It is the same construction as the TSG-3150 but made extra wide for the hard-to-fit. The outer glove is 100% virgin Twaron® and the inner glove is made with 100% cotton, combined at the cuff edge to create a single glove system. The TSG-144 includes a 2" cuff with an overcast edge, providing additional protection at the wrist area. 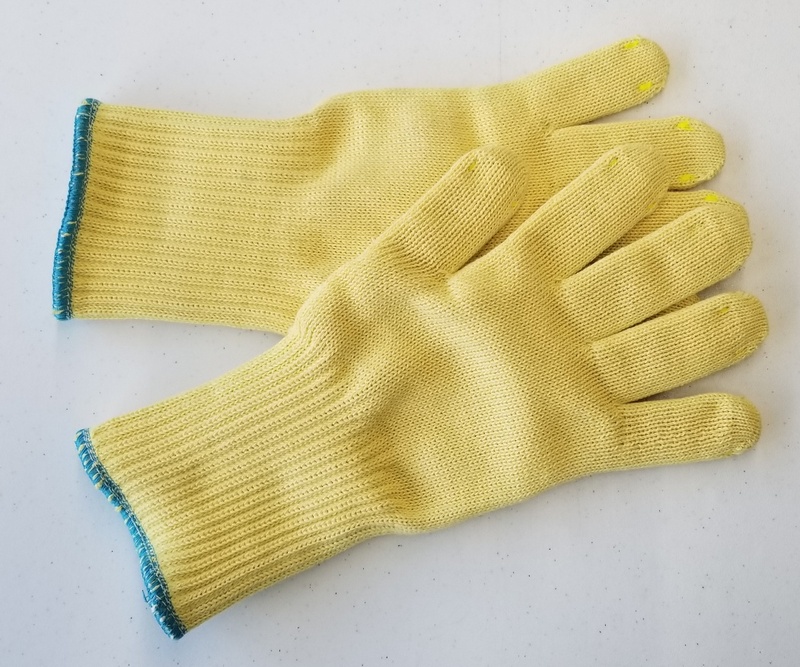 Fit and sizing of the TSG-144 are incremental, providing consistency of product and performance.This glove is also able to be laundered, providing cost saving opportunities. ​The TSG-144 glove-in-a-glove targets work areas requiring heat, cut, and abrasion protection such as parts handling, stamping, and some plastics departments. PRODUCT DESCRIPTION: The TSG-141 is a 7 gauge heavy weight Glove-in-a-Glove. It is the same as the TSG-3150 but the inner glove is made with Nomex®. The outer glove is still 100% virgin Twaron®. They are combined at the cuff edge to create a single glove system. The TSG-141 includes a 2" cuff with an overcast edge. Fit and sizing of the TSG-141 are incremental, providing consistency of product and performance.This glove is also able to be laundered, providing cost saving opportunities. The TSG-141 glove-in-a-glove targets work areas requiring heat, cut, and abrasion protection such as parts handling, stamping, and some plastics departments. PRODUCT DESCRIPTION: The TSG-145 is a 7 gauge heavy weight Glove-in-a-Glove. It is the same construction as the TSG-141 but made extra wide for the hard-to-fit. The outer glove is 100% virgin Twaron® and the inner glove is made with Nomex®, combined at the cuff edge to create a single glove system. The TSG-145 includes a 2" cuff with n overcast edge, providing additional protection at the wrist area. 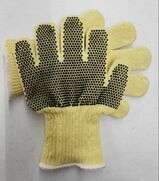 Fit and sizing of the TSG-145 are incremental, providing consistency of product and performance.This glove is also able to be laundered, providing cost saving opportunities. The TSG-145 glove-in-a-glove targets work areas requiring heat, cut, and abrasion protection such as parts handling, stamping, and some plastics departments. PRODUCT DESCRIPTION: The TSG-9000 is a 7 gauge heavy weight glove. The two inner gloves are constructed with 100% Cotton for 360°F thermal protection and comfort. The outer is constructed with 100% virgin Twaron® with a 19oz aluminized gauntlet for molten protection! The high heat silicone dots provide heat dissipation, excellent grip, and dexterity. 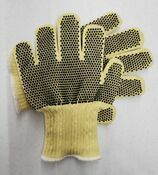 The dots on both sides make this reversible and extend the life of the glove and your investment. When the gloves were sent for heat testing, we received a call asking for us to send more. Of course we wanted to know why. The facility advised that at the highest ASTM Level 5, these gloves would not register heat. Say what? Yes, it's true! So we sent more. While the highest ASTM Level 5 is 608°F, the testing facility agreed that they would document at what temperature heat was finally registered. The marketing sheet is under construction. Contact Tri-Star Glove today and find out what we can customize for you!